We each have 7 energy channels in our body that work together to channel our spiritual life force. Each one is an energy center that acts as a pump or valve by regulating and controlling the flow of energy through our energy systems. In turn, this idea relates directly back to the ancient meaning of the word “chakra,” which in Sanskrit terminology means “wheel” or “turning.” Thus, they are commonly viewed and imagined as whirlpools of flowing energy. Each chakra is located in a specific area of the body and is associated with different meanings, traits, feelings, colors, gemstones, abilities, and more. The 1st chakra, or the root chakra, is red and located at the base of the spine. It’s also known as the Kundalini energy chakra and is associated with security, instinct, survival, and it helps stabilize and ground us. The 7th chakra is located at the top crown part of your head, is violet in color, and is where our spiritual connection, knowing, oneness, and understanding resides. The other five chakras are all in between these two and include the third eye, throat, heart, solar plexus, and the abdomen. We each have one that is more forceful than the others and influences our daily life in more impactful ways. Based on the choices you make, what appeals most to you, and how you view situations, you can figure out which one you’re most connected to at this moment in your life. Over time, the chakra you mainly operate from may change as you grow and become more aware or affected by different things on your life’s path. If you are interested in learning more about the chakras be sure to check “The Chakras & Their Functions” and “How To Balance Your 7 Chakras System“ to learn how to balance your chakras. 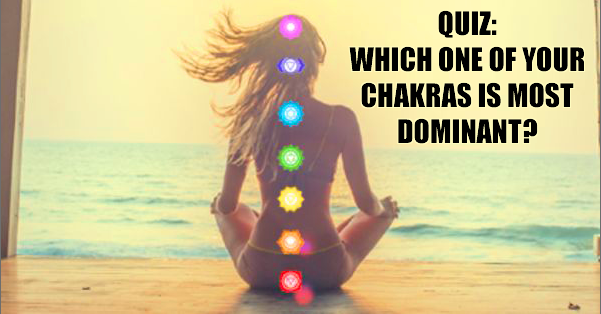 For now, take this quiz to find out which one of the 7 main chakras is most dominant in your life, and as always, have fun and enjoy! very loving Earth Angel with a Pleiadian soul. With doing this test i wanted to make sure and see if what i thought my dominant chakra , is really my dominant chakra. I didn’t get disappointed and was right on the mark. This test is really usefull and spot on. Root Chakra is my dominant chakra and the description is spot on. very enlighting. Yes! For the most part, especially need for security! My intuition serves me well most times but I get frustrated when I get ‘shot down’ by other meanings! IT sure does!! Although, my crown is very active lately!! No it doesn’t, actually every other test I’ve taken has told me that my heart chakra is at under active. I like to do these quizzes. They say the nicest things. Mi Chakra Dominante es el de la garganta ya que es verdad el resultado del test..